These Farm Heroes level 438 cheats and tips will help you beat level 438 of Farm Heroes. 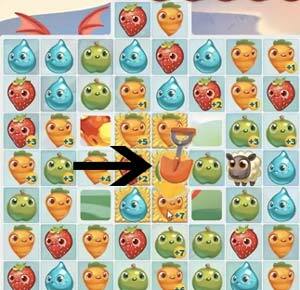 The objective of Farm Heroes level 438 is to reach 100% growth in 32 moves by collecting 10 sheep, 110 strawberries, 110 apples, and 110 carrots. 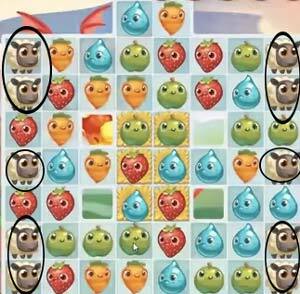 Farm Heroes Saga level 438 is quite difficult and frustrating thanks to the needed ten sheep. Collecting the sheep are the absolute number one priority in this level. Don’t even worry about your needed cropsies for the first couple of turns. To heard a sheep you will need to move a sheep to a square of hay. As you can see, you are presented with sic stacks of the yellow hay. To bring the sheep to the hay you will need to make an adjacent match alongside of a sheep. The sheep will then travel to the square where the match was completed. This process will need to be repeated until he reaches hay. In other words, the final match needs to made on the hay. Because there are four squares missing around the hay, you may have a difficult time creating a direct path for the sheep. Therefore, you need to come up with a sound strategy to heard the sheep. Be careful not to move a sheep to a square you do not want it. It is also important to work efficiently and conserve your moves when you are shifting the sheep. To do this, you will need to make the adjacent matches alongside the sheep count towards your required cropsies of red strawberries, orange carrots, and green apples. If you continue with this method, you will have no problem collecting the needed cropsies. As a plus, your required cropsies take up much of the board. 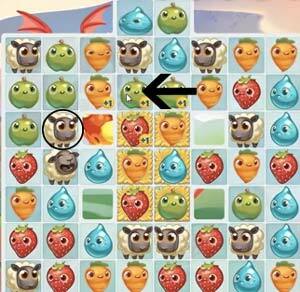 The only exception here is the blue water droplet, which you should try not to waste moves on. Boosters could play a large factor in Farm Heroes Saga level 438. The most important booster to use is the shovel booster. The shovel booster will remove nearly anything in your way of progressing through the level. For this board, you should use the shovel to remove anything blocking a match and path for your sheep. Remember, the shovel booster will cost you no moves.